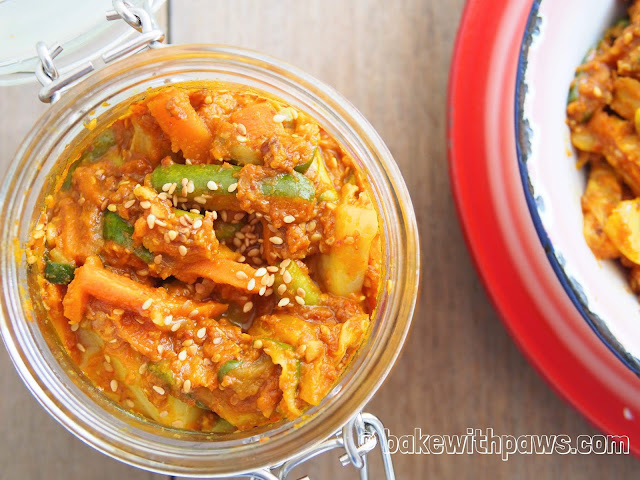 I have always wanted to make Acar but after seeing the recipe for the first time I was put off as because it had so many steps. I finally attempted it recently using the recipes from Nonya Flavours Cookbook with some modifications. I chose this recipe because I prefer the Penang style of Acar which has a little more herb and aromatics. I was happy to watch the Acar disappear as soon as I put it on the table! 1. Cucumber – Cut lengthwise to quarter and remove away the core. Cut into 3 cm long strips. Knead 1 tablespoon & 1 teaspoon of salt into the cut cucumbers. After 30 minutes, squeeze out as much liquid as you can with a clean muslin cloth. Set aside. 2. Carrot – Quarter lengthwise and cut into 3 cm long strips. Knead 1 ½ teaspoons of salt into the carrot. Squeeze out the liquid as above after 30 minutes. You may skip this step if you prefer the carrot to softer bite. 3. Cabbage – Cut into 3 cm square. 4. Long beans – Cut into 3 cm length. 5. Pineapple – Cut into small pieces. 6. Lay all the vegetables on the trays and dry under the sun for 2 to 3 hours. But, I dried the vegetables in the oven with fun mode (without turning on the temperature) for 2 to 3 hours. 7. Scalding the vegetables – In a medium pot, bring water, vinegar, sugar and salt to rapid boil. Blanch the dried vegetables, one type at a time. 3 to 4 seconds for cabbage and about 10 seconds for the rest of vegetables. Drain them in a colander. 1. Blend all the spice paste ingredients in a food processor. 2. Heat oil in a wok, stir fry the spice paste until fragrant and the oil begins to separate. 3. Season with sugar and salt. 4. Off the fire and add stir in the vinegar. 5. Add in all vegetables and stir until thoroughly mixed. 6. Stir in the roasted peanuts and sesame seeds and mixed well. 7. After cooling, transfer the acar to air tight container and keep in the refrigerator up to two weeks. 8. You may serve immediately. But, the best is overnight to allow the flavours to develop. Hi! :) First, I just want to say that I am a big fan of your recipes (just by looking at them, haven't had the opportunity to try any of them yet! 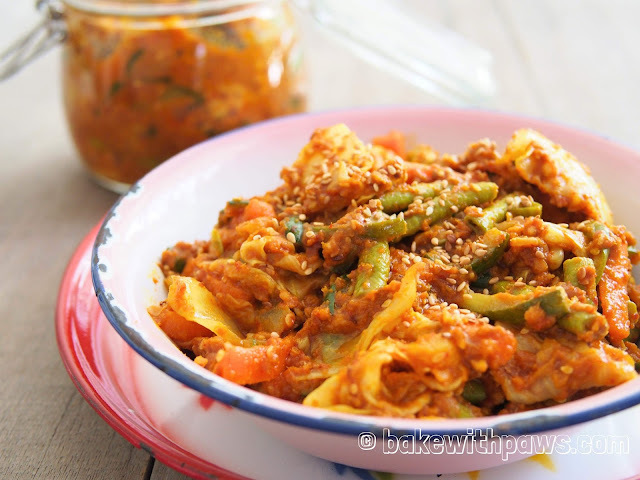 As for this one, I wanted to ask you what can we serve the penang acar with? Is this eaten as a side dish? I would like to apology for late response as I am still not familiar with this new platform. I will try my best to response as soon as I can in future. Thank you for dropping by and the following my blog. Acar is usually serve as appetizer or side dish. I am so grateful for your sharing the recipes and your guidance on the proper way of preparing Penang Nyonya Dishes. I am actually trying to pick up all these dishes. I am worried that eventually all these skill of preparing the Penang Nyonya Dishes will be gone. You are doing a fantastic job. Do keep it up. May be you might want to share on Penang Poh Piah, Jiu Hu Char, Vegetarian Chup Chai, Choon Piah etc. Thank you once again for your recipes.